Five men were jailed yesterday for conspiracy to supply £2 million worth of cannabis. Fouad Raihani from Acton, and four other men (Hamid Charkaoui, Paul Mottley, Dawood Ahmad and El Hosain Charkaoui) were jailed for a total of 22.5 years. The sentences were possible due to a proactive intelligence led operation by the Metropolitan Police Service's Serious and Organised Crime Command. On Thursday 7 May 2009, officers observed Hamid Charkaoui and Raihani supplying a considerable quantity of cannabis to Mottley and Ahmad, believed to be for further distribution in Manchester. The pair had been seen unloading a number of cardboard boxes from a Luton style box van into an underground garage that day in Kilburn. A short time later, Mottley pulled up in a nearby street driving a silver Seat, closely followed by Ahmad in a white panel van. Both vehicles were registered to Manchester and had been driven to London in convey earlier that day. Charkaoui then drove the white panel van down the ramp and parked it next to the Luton van. He and Raihani were then seen removing further boxes from the Luton van and putting them into the panel van. Whilst this took place Mottley and Ahmad were both sitting in the nearby Seat, apparently waiting for Charkaoui to return with their van. At this stage detectives intervened and detained all four men for a drugs search. 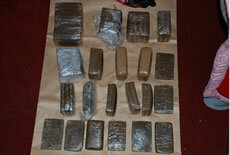 In total police found 61 cardboard boxes, each containing between 10 and 25 heat-sealed clear plastic bags of cannabis. Of these, 12 boxes were in the garage, 11 boxes in the panel van and two boxes still remained in the original Luton van. The total weight of cannabis was approximately 600kg. All four men were searched and arrested for conspiracy to supply class B drugs. Charkaoui had two mobile phones on him and a further two in his car. He was also found to have a set of keys in the car. Police went on to search a further six addresses, including a flat in Ebbsfleet Road which the set of keys in Charkaoui's car unlocked. At this address officers found a money counting machine, approximately 6kg of amphetamine in three plastic bags and a total of 29 cellophane wrapped packages of brown resin, later identified as cannabis. The drug was also found in a number of sports bags concealed around the flat. Also recovered from the flat was a cardboard box similar to the ones used to carry the drugs found at the garages. From the remaining addresses, a total of £11,000 cash was seized, along with a heat sealing machine, a roll of heat-seal plastic and 19 rounds of ammunition. In police interview, Charkaoui produced a prepared statement saying that he had been acting as a favour to a friend and that he and Raihani had collected the boxes together from Park Royal, without knowing the content of them. He claimed that the keys to Ebbsfleet Road belonged to his uncle, El-Hosain Charkaoui, and again claimed not to have any knowledge of the drugs found inside. During interview Raihani claimed that Hamid Charkaoui had asked him to carry out the delivery job for £500 and that he had asked no questions regarding the nature of the business. Ahmad claimed to have driven the panel van in convoy with his friend Mottley, driving a silver Seat, from Manchester for a day out in London. When they parked in London, he was approached by an Asian male who said that Mottley had said for him to hand over the van keys, which he did and then got into the car with Mottley. Mottley made no comment during interview. All four men were then charged with conspiracy to supply class B drugs. Mottley was further charged with possessing ammunition without a license. Following the charges, El-Hosain Charkaoui was circulated as being wanted in connection with the drugs located at his home address of Ebbsfleet Road. On 19 May 2009, he was arrested having returned to the UK from Spain. He claimed that he had lent his keys to his cousin and knew nothing of the drugs. He further stated that he had been away in Spain on holiday since 3 May 2009. During interview he made no comment and was later charged with conspiracy to supply class B drugs. said: "This was a significant haul of cannabis that we have successfully removed from circulation. Today's sentencing is testament to how seriously the criminal justice system takes this class B drug." Hamid Charkaoui 31, a shop keeper from Colville Terrace, W11 was sentenced to seven and a half years in prison. Fouad Raihani 34, a self employed delivery driver of Galsworth Court, Bollo Bridge Road, was sentenced to five years in prison. Paul Mottley 26 and unemployed came from Salutation Street, Manchester. He was sentenced to five years in prison, four years for the cannabis and one year for the ammunition, to run consecutively. Dawood Ahmad 25, also unemployed and from Manchester was sentenced to three and a half years in prison. 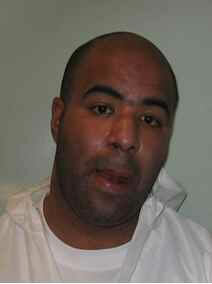 El Hosain Charkaoui, 39 and a mini cab driver from Ebbsfleet Road, NW2 was sentenced to 18 months in prison.